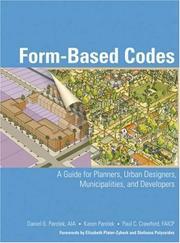 A comprehensive, illustrative guide to Form-Based Codes “This volume describes in clear argument and significant detail the issues and techniques associated with the design and management of Form-Based Codes as an antidote to zoning and sprawl. Reading it and putting it to practice is an excellent point of departure for individuals and municipalities to safeguard and to grow their communities.” – From the Foreword by noted architect and urbanist Stefanos Polyzoides Form-Based Codes are the latest evolutionary step in the practice of development and land-use regulation. A growing alternative to conventional zoning laws, Form-Based Codes go beyond land use to address not just the physical form of buildings but also surrounding streets, blocks, and public spaces in order to create, protect, and revitalize sustainable communities. Written by three recognized leaders in the field of New Urbanism, including an urban planner and an architect, this book is the first to address this subject comprehensively. After defining Form-Based Codes and explaining why they are a necessary alternative to conventional zoning regulations, the authors detail the various components of Form-Based Codes and then go step by step through the process of creating and implementing them. Finally, a series of case studies illustrates best practice applications of Form-Based Coding at various scales from county-wide to site specific, and various project types from city-wide development code replacement to the preservation or evolution of downtowns. This timely and accessible text features: bad_isbn_list.txt bashscript_old isbn_list.txt temp thee_output.txt the_output.txt More than 200 clear illustrations of Form-Based Codes bad_isbn_list.txt bashscript_old isbn_list.txt temp thee_output.txt the_output.txt Studies of real-world applications of Form-Based Coding by leading planners, urban designers, and architects Form-Based Codes is a must-read for today’s urban designers, urban planners, architects, and anyone with a vested interest in utilizing the latest regulatory tool to help create compact, walkable, and sustainable communities.